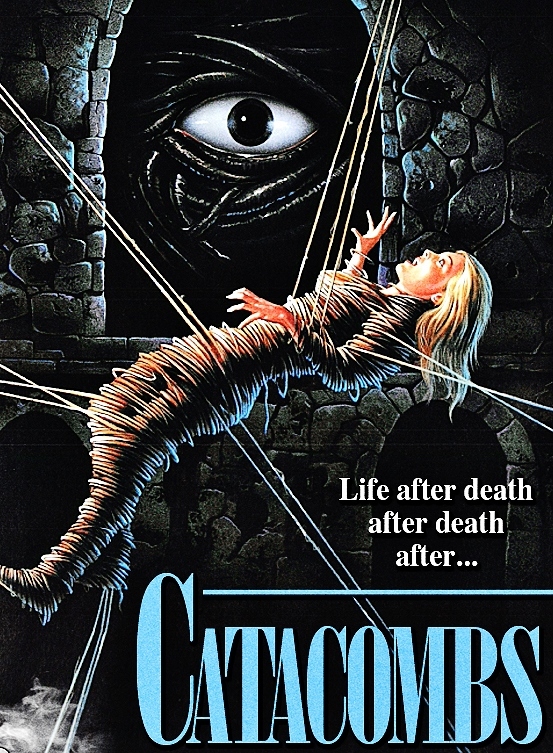 Produced by Charles Band for Empire Pictures, Catacombs is one of several titles that got shelved for a few years during the studio's bankruptcy of the late 1980s. When the film was finally dusted off in 1993, it was released under the name Curse IV: The Ultimate Sacrifice. The movie doesn't actually have anything to do with The Curse or its sequels, and was named as such in an attempt to cash in on the recognizable, established franchise. Catacombs is the story of an evil force (more literally, a demonic presence), that exists within an abbey located in the Italian countryside. 400 years ago, the monks defended their abbey from this evil and sealed it away deep inside the catacombs beneath the church. Now that evil has been reawakened and unleashed upon a new generation. Unfortunately, this is no episode of Supernatural. Maybe one of the things that I find a bit challenging here is that, instead of a straight up physical battle between good and evil, most of Catacombs deals with spirituality, faith, and the nature of evil in a more abstract way. There's a ton of religious iconography, especially of the catholic variety, and a lot of this imagery seems intended to be loaded with subtext. For instance, there's a statue of a crucified Jesus Christ inside the church, but the filmmakers have opted for the statue to be portrayed by the life-cast of an actual human being. While this makes more sense later in the movie, every time we see that crucifix, it's clear that it's not a traditional statue, but more akin to real flesh and blood. This is just one choice that makes for a surreal, slightly unsettling experience. It's possible that more devout viewers may even be offended by certain story elements, though nothing seems intended to be overtly sacrilegious. 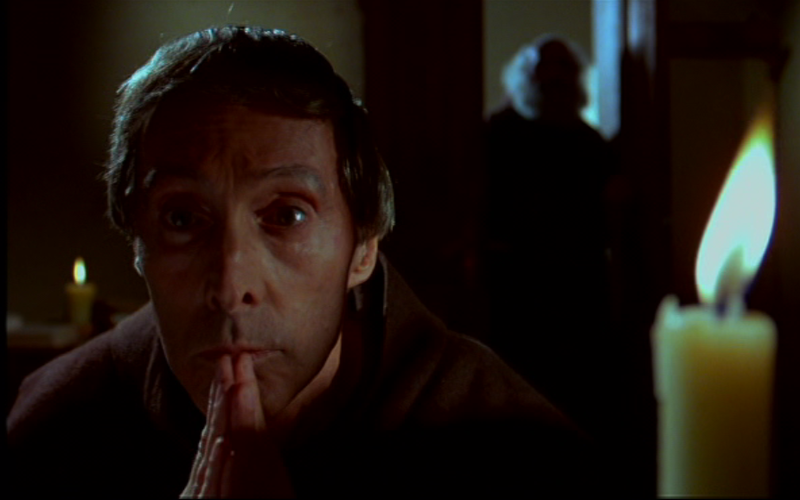 The abbey's monks themselves are comprised of some really great actors, including Ian Abercrombie, who most American viewers might remember best as Mr. Pitt from Seinfeld, who ate a Snickers bar with a fork and knife. 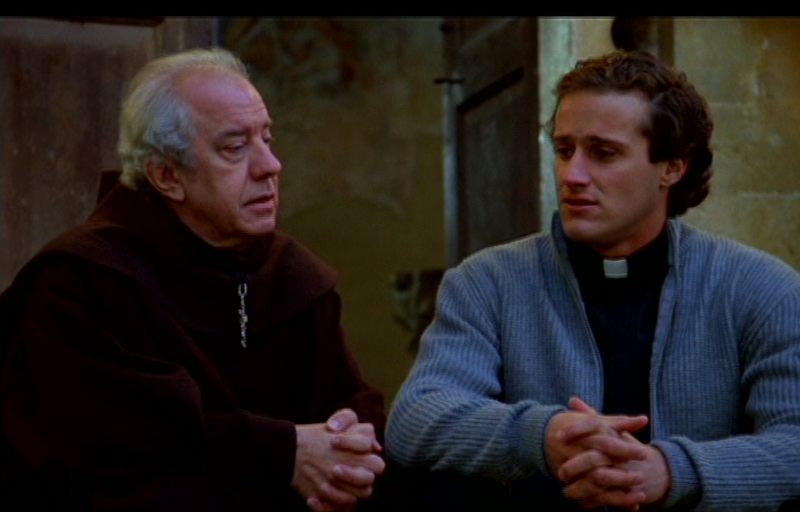 Timothy Van Patten (Class of 1984), Vernon Dobtcheff (Indiana Jones and the Last Crusade), and Feodor Chaliapin Jr. (Inferno, The Church, Moonstruck) are also monks at the abbey, and feel pretty authentic. One of the things impressed me is that these monks don't feel like creepy old men as many monk-themed movies depict (I'm looking at you, In the Name of the Rose), but individual guys who have unique personalities and theological differences of opinion, yet inhabit their abbey because they feel a spiritual calling. Rounding out the cast of leads is Laura Schaefer (Ghost Town), who plays a teacher who arrives at the abbey to study and ends up getting caught up in the intrigue. There's not much more to say about her, which is too bad. This movie was directed by David Schmoeller, who should be no stranger to fans of Charles Band's wacky worlds. Schmoeller wrote and directed Tourist Trap and Puppet Master (aka Puppetmaster if you're nasty), two of Band's more recognizable hits, and his name is recognizable among horror movie aficionados as a guy who can make a low budget--yet memorable--horror flick. Here the Texan co-writes (under a pseudonym) and directs with a decidedly European panache that seems a little different from his other work, or at least feels different enough to me that I wouldn't connect this film to his earlier work. These Euro-leanings are what makes Catacombs feel more cerebral and internal than the usual schlock (I mean that affectionately) that we are accustomed to from Band's Empire and Full Moon. The location filming in Italy goes a long way to giving this low budget film decent production values, and the sets of the catacombs and interiors of the church look really great. Between the fantastic actors in the film (Schmoeller discloses in his commentary that some actors agreed to be in the picture so they got a free trip to Italy), the beautiful and atmospheric location shots, and the creative use of the sets, the movie overcomes its small budget and feels a lot like something bigger and with more money. Because I don't come from a catholic background, horror movies that rely on motifs that use catholic imagery and storytelling devices don't usually engage me on the level that I sometimes wish that they did, and that makes this movie more of a curiosity for me than a full-blown success. The horror movies that often affect us the most are the ones that twist and prey on the stuff that's already deep inside us, so your mileage may vary. This story unfolds very slowly, and there are very few of the "crowd-pleasing" elements that I expect when I watch something like this. There isn't a lot of gore. There are no chases, no gratuitous skin, and no really big, over-the-top kills or heroics. Most of the story consists of bearded men sitting around talking to each other about good, evil, faith, and love. If you're into religious horror that plays out metaphysically in cathedrals and churches, this might be more up your alley than mine. It's not bad; the cast is talented, the performances are solid, and the locations add to the story. It's just not particularly my cup of tea, and I kept waiting for things that never came. I also think the film's lack of levity really works against it, but--again--I recognize this is completely a matter of taste. These are the very qualities that might draw some movie fans to this film. 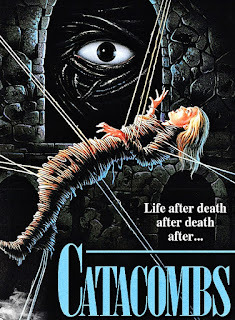 Catacombs is part of Scream Factory's "All Night Horror Marathon Volume 2." 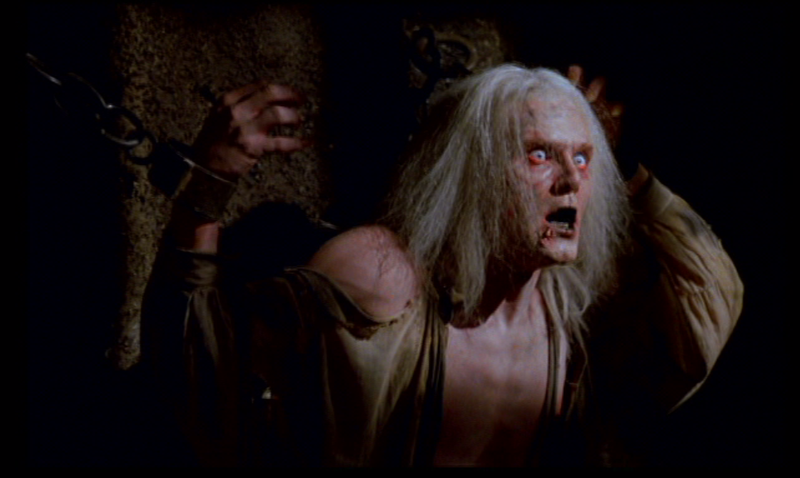 It was also released as a double feature Blu-Ray with the outstanding Cellar Dweller. Both packages feature an audio commentary by David Schmoeller which is informative, engaging, and--frankly--better than the movie itself. This one is for fans of Euro-horror, religious-themed horror, or fans of Charles Band's low-budget legacy.